We have a real gopher problem in our backyard. We get their mounds all over the yard, and of course if we plant directly into the soil, we know we risk losing that entire plant to the gophers. 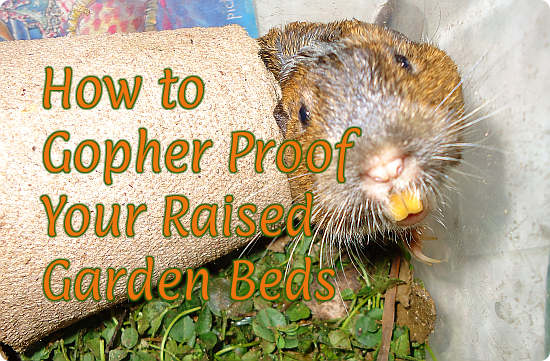 Building a raised garden bed, however, can make it much simpler to avoid damage from gophers. This solution is very simple. Build your raised garden bed, and put a good quality hardware cloth on the bottom, so that gophers cannot get through. Attach this to the bottom of your raised garden bed with staples and overlap enough that gophers cannot get through. It’s that simple to keep them out. They may still get any roots that grow past the hardware cloth, but most of the roots of your plants will be completely safe. Of course, you’ll probably want to deal with the gophers for the sake of the rest of your yard. I prefer natural methods, and much miss the neighbor cat who used to handle my gopher problems for us, and was a total sweetheart besides. My landlord says we can only have an outdoor only cat, and with the coyote pack living nearby, there’s no way I would do that. I would have to bring the cat in at night. Sometimes you’ll be fortunate enough to have an owl or snake help you out. We caught a very young gopher snake in our yard once, but we’ve never seen it since – pity. It was beautiful. We didn’t have much of a gopher problem at that time, so it probably didn’t stick around. Some also say used coffee grounds work as a gopher repellent. My husband tried this once, and it seems to work pretty well. Unfortunately, we aren’t coffee drinkers, so getting coffee grounds takes some actual effort; it’s not something we just have around the house. Some plants love the acid in coffee grounds, so you may even benefit your garden by using them. You can also trap gophers. You can follow this link for some advice on the U.C. Davis website, and you can check with your local hardware store or garden center, as well as Amazon.com for traps. I’m not a fan of poisoning gophers – too much can go wrong for other animals. There’s really only so much you can do about gophers coming back – they’re persistent critters, and these steps won’t protect against other pests. The best you can do is take steps to keep them away from your most vulnerable plants, and learn to handle it when they do come around. Published by Stephanie, in Gardening. Tagged with gophers.